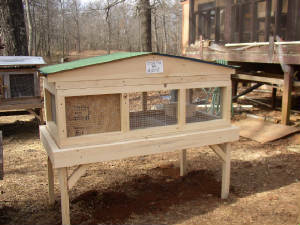 My Breeder Hutch designs are probably the most durable and affordable on the market today !!! Quality construction helps to insure several years of service with a minimal amount of repairs and upkeep. The 4' Premium 2 Door Hutch comes with Roof, Stand, and a custom built Feeder Tray all for the very low price of just $195.00 !!! These are also available in groups of 4 or 6 to create a Pet Breeding Station !!! The 4' Premium 3 Door Hutch has all the great features of the 2 Door Premium, but I've added a Lift-Top Feature to make it even more accessable for cleaning or feeding... A Great Value at just $225.00 !!! 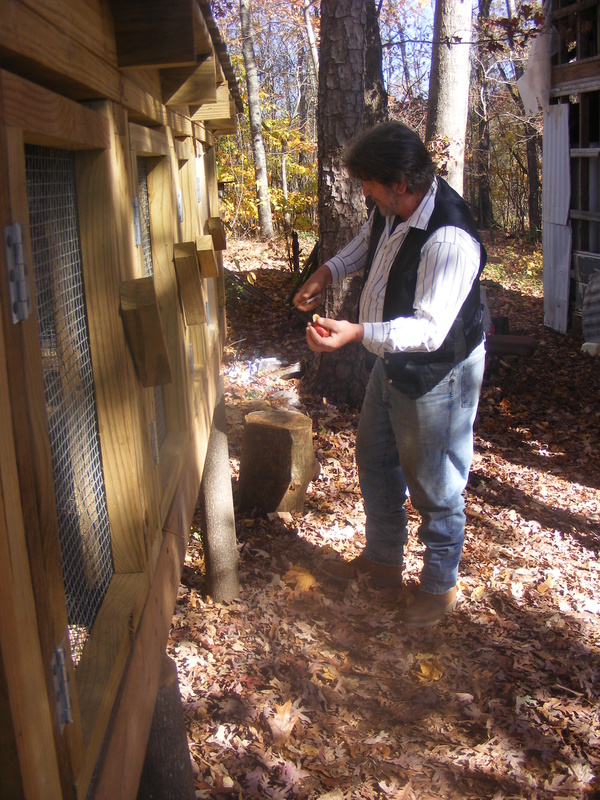 Many options are available for a multiple "Pet Pen System"... For a free consultation, feel free to visit our farm, ( Pet Rabbit Ridge ) during regular business hours. We are very flexable and willing to work with you in any way possible to create a Pet Pen System that is right for you. Very Affordable at just $195.00 !!! New 4' Lift-Top Pen With Stand & Roof $125.00 . New 4' Lift-Top Pens !!! Our Totally New Design of "Lift-Top" Pens make it very easy to care for your Pet Rabbit... I use the 4' design to display baby rabbits I have for sale and it really makes things a lot easier... This particular Pet Pen measures 12" deep on the inside... Reasonably priced at just $125.00... Also available in 16" deep model for just $150.00 !!! 3' Lift-Top Pens are just $100.00 !!! 3' Lift-Top Pen Models Start at Just $100.00 !!! My Pet Pen designs are very practicle and affordable... Each Pet Pen is designed to interact with other Pet Pen components to create the perfect housing and breeding system to meet your every need. Keep things as simple as you like, or go all out to create your own personal pet breeding station ! Although I've designed these Pet Pens with rabbits in mind, they can also be used for any small pets that need constant containment. I have designed these pens with children or the disabled in mind making it easy for them to take care of their project without assistance. 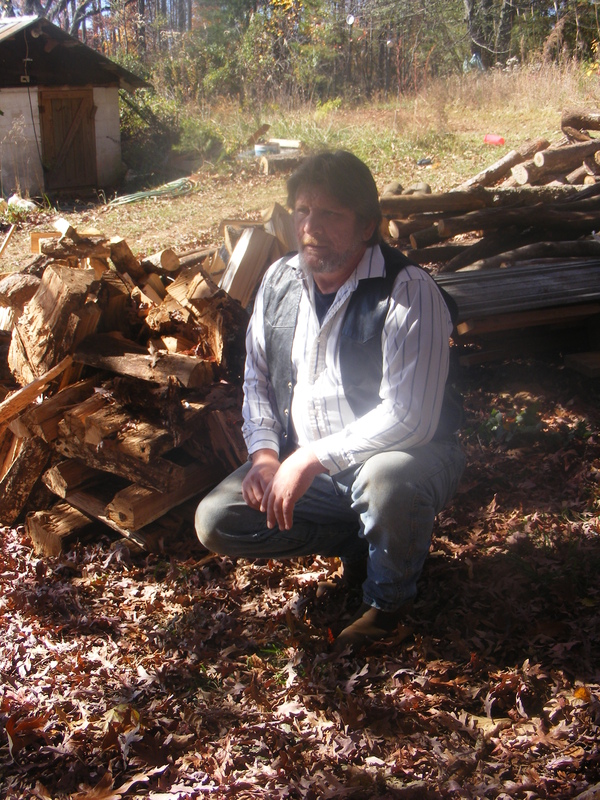 Taller stands can be provided upon request, but must be considered as a "Special Order" that will have to be manufactured at my earliest convenience, and an extra charge will be added for additional materials. 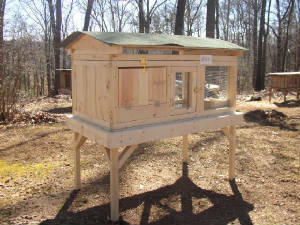 3' Lift-Top Pen with Roof, Stand & Feeder Tray... Just $100.00 !!! 4' Lift-Top Pen (12" depth) with Roof, Stand & Feeder Tray... Just $125.00 !!! 4' Lift-Top Pen (16" depth) with Roof, Stand & Feeder Tray... Just $150.00 !!! 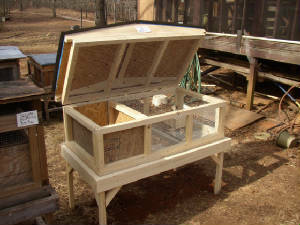 4' Premium 2 Door Hutch with Roof, Stand & Feeder Tray Just $195.00 !!! 4' Premium 3 Door Hutch with Roof, Stand & Feeder Tray... Just $225.00 !!! Complete Pet Pen Systems are available with 4 and 6 Breeder Hutches housed together under 1 roof !!! A great way to keep your breeding project compact and easy to manage. Complete installation is available after purchase for a set fee, depending on the distance you are from our location plus labor. We will install the elevated stands to place your "Pet Pen System" on, as well as install a roofing system over the entire bank of pens.